Three-year-old Oakley Kidd of Powell has her hands full, with hat in one hand and horse lead in the other, during the Park County Fair mini horse show Friday. Kidd was a spectator at this show but is an up-and-coming cowgirl on the show scene. Sydney Olsen gives her chihuahua, Sam I Am, a congratulatory kiss after winning Best in Show at the Park County Fair dog show Thursday. Abigail Visocky repositions her feline during last week’s cat show at the Park County Fair. If you’re wanting to catch a country music concert, cheer for colliding cars or crave cotton candy, then you’re in luck: The Park County Fair is here. The 2018 fair kicks off today (Tuesday) with free admission. Continuing a tradition, Tuesday night’s entertainment is pig mud wrestling. Things start at 7 p.m. at the Main Grandstands, where slippery swine will do their best to elude teams of local kids and adults. Wednesday promises to be busy, with a variety of events celebrating Park County Day, a new addition to the fair lineup. “This is an opportunity to take the fair back to the roots of homemade and locally raised,” said Teecee Barrett, events coordinator for Park County. Barrett said she’s excited about all of the Park County Day events, which kick off at 9 a.m. Wednesday with the Bred and Fed Contest in the beef show ring. The livestock contest is for market lamb, goat, beef or swine born and raised in Park County. “Park County Day is the focus with the locally raised livestock being featured as well as the sugar beet contest [and] the home brew contest that features locals,” Barrett said. Other Park County Day events include stick horse races, a roping series, cookie decorating, a watermelon-eating contest and an ice cream social. On Wednesday night, country music star Easton Corbin will take stage at the Main Grandstands. Charley Jenkins will return to Powell as the concert’s opening act, beginning at 7 p.m. Admission is free to the fair until 1 p.m. Wednesday, and then there’s a discounted rate of $3 for seniors and military the rest of that day; for others, the regular rate is $5 per person. On Thursday, admission will again be free until 1 p.m., then regular admission prices kick in. Thursday night’s entertainment is the ranch rodeo, beginning at 5 p.m. in the Horse Arena. A dance will follow the rodeo. Johnsonville’s Big Taste Grill will roll into town on Friday. The semi-turned-grill measures 65 feet long and can cook more than 750 brats at a time. Brats will be sold Friday and Saturday, with Johnsonville donating $1 from the sale of each brat to the Park County fairGROUNDS Foundation. On Friday night, Endurocross returns to the fair, with races beginning at 7 p.m. in the Main Grandstands. Riders with Octane Addictions, an extreme motorsports company based in Billings, will be featured at this year’s Endurocross. Saturday — the final day of the fair — is jam-packed with activities. The morning begins with the Park County Fair Parade, which will roll through downtown Powell at 10 a.m.
For 4-H and FFA youth showing their animals at fair, the week culminates with the Junior Livestock Sale, which will start at 1 p.m. Saturday. Always a local favorite, the demolition derby rounds out the week on Saturday night. Cars start smashing at 6 p.m. Throughout the week, there will be plenty of food, a variety of free stage entertainment acts, carnival rides, activities for kids and livestock shows. Some local youth got an early start to the fair as several 4-H shows got underway last week. “It’s always fun to see the kids so excited about their projects and the opportunity to show off their hard work,” Barrett said. 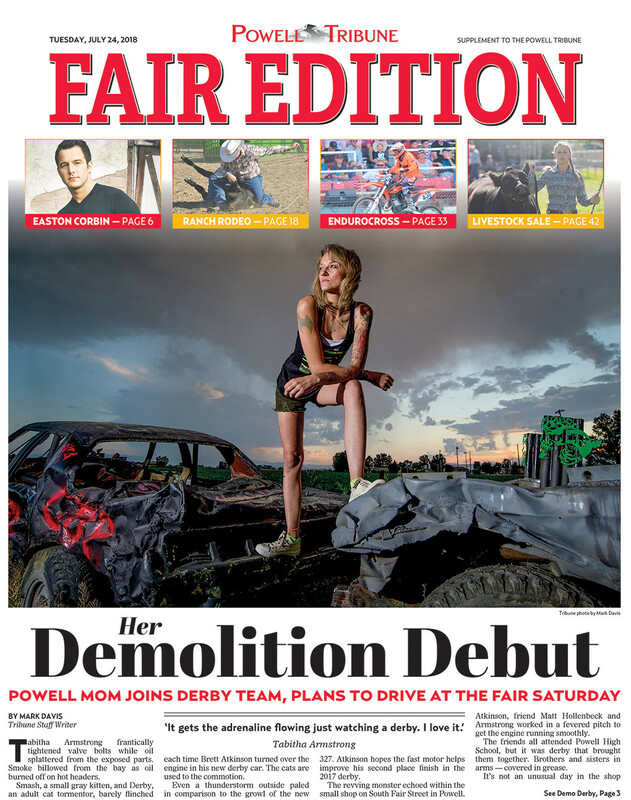 For more information about this year’s fair, see the Park County Fair Edition in today’s Tribune or visit www.parkcountyfair.com.